Maid service 3 times x week. More upon request. The house is located in the town of Civita di Bagnoregio on one of the highest points, the old Etruscan acropolis. Civita is located in the northern most corner of the Lazio region at the border of Tuscany and Umbria. See Map below. To arrive at the foot of Civita di Bagnoregio is to discover a place that until then only existed in dreams: the ultimate Italian Hill town preserved by a rich and splendid history and by the love of its current inhabitants. Entering the old town by walking over its footbridge and going through its Etruscan gateway is like stepping back in time 600 years to rediscover the beauty and peace of a different way of life. The town appears almost made of gold and silver - the gold of the tufa rock of its cliffs and houses, the silver of its basalt paved streets. Like a jewel that was eroded by time only to preserve its most beautiful core, Civita will transport you to a place of wonder and poetry, close to the incredible history of man’s tenacity and vision, to nature’s endurance and labor of love. Civita’s most illustrious citizen, the philosopher Saint Bonaventure, once said “sentiment penetrates where intelligence does not reach”and the town in many ways represents just that...a place to get lost in, beyond our understanding of it. We believe that Civita is one of the most noble and beautiful places on earth and by restoring a small piece of it we wanted to partake of the magic that enticed us when we first fell in love with it. The restoration of Domus Civita was first of all an homage to a town that survived earthquakes and landslides, war and famine, and found its rightful place in our modern world; and, secondly an attempt to provide a unique experience of serenity, beauty and respite for the discerning traveler and lover of Italy. The house is available on a weekly basis from Saturday to Saturday, year round, and for long weekends in low & shoulder seasons. Please submit your reservation request and we will confirm availability and price. Rates are inclusive of house cleaning, all utilities, Wi-Fi, bed linens, all towels including pool towels, soaps, detergents, bathroom amenities. House and pool heating are not included in low & shoulder season. Rates listed are for occupancy of 6. Fees apply for 2 extra people in twin beds. Orvieto (20 min. ): Etruscan & Roman archeological sites, 12th century gothic cathedral, medieval quarter, shopping, great restaurants. Bolsena and surroundings: (15 min. ): Historic town of Bolsena, fishing village of Marta, Montefiascone as well as Lake activities and boat tours. Todi & Spoleto (40 min. ): beautiful medieval and renaissance churches, unique natural settings, charming streets and excellent museums. Historic Gardens (20-40 min. ): Villa Lante, Bomarzo, Caprarola and Vignanello are all unique historic gardens and villas of great beauty. 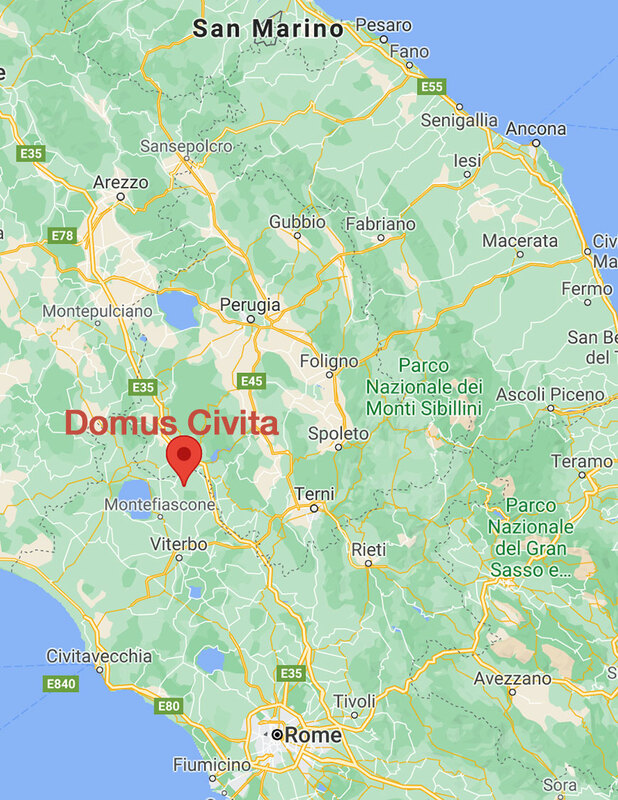 We would be happy to help you with the planning of your stay at Domus Civita and to organize any other services not listed above.